Summer is coming up fast and with it comes vacation rental guests galore. While more business is definitely always welcome, summer can be a stressful time for vacation rental owners. This is especially true if they head into the season unprepared. Therefore, prepping ahead of time and creating a solid plan for the months to come are non-negotiable tasks. Below, we have compiled 6 tasks to look over before things get busy. Be sure to check these off your to-do list in the next few weeks and you’ll be more than ready when summer arrives. #1: See your place from a new point of view. Guests don’t want to arrive to find worn and inoperable items at your vacation rental. Clearly, things like broken faucets and faulty refrigerators must be fixed immediately and hopefully, haven’t been left for fixing during spring cleaning. However, there are other, smaller things that may go wrong or become worn out and sometimes, it’s hard to see what might appear too worn to a guest. Therefore, it is crucial that property owners take a good look at their rentals from the point of view of someone who has never seen the place before. Some people are able to do this on their own while others choose to bring in a trusted friend to help them find flaws. Once the issues have been pinpointed, be sure to fix them as soon as possible. A flaw may seem tiny to you but to your customers, the same thing could be a big deal. For this reason, you will want to ensure absolutely everything is in tip-top condition before people begin to arrive. #2: Update your online presence. Whether you run a website of your own or advertise on a larger rental site, updating your listing (along with any accompanying photos) can work wonders for building your guest base. This means updating your prices for peak season; making sure all amenities are listed; and adding new, summer-friendly pictures, such as images of the gorgeous swimming pool or the amazing beach view. Additionally, now is the time to keep your social media pages as active as possible. Post ideas for fun things to do in the area near your rental, include images of your property and the surrounding attractions, and be sure to answer comments and questions promptly. Asking friends and family to share posts can also help spread the word about your property, potentially bringing in more guests during the vacation season. #3: Add some summer flair. Winter is a time for evergreen wreaths, dark-yet-warm colors, and cuddly blankets and pillows. However, now that winter has passed, it’s time to put away the warm and cozy items and add something bright and fun. This might mean switching out wall hangings, putting brightly colored flowers in a vase on the table, changing the bedspread to something more lightweight, or even adding an iced coffee brewer to the list of amenities. Additionally, if a pool is available to guests, it could mean purchasing new poolside furniture or swapping out the dishes for something colorful and pool deck-friendly. Obviously, it is important to restock clean linens throughout the property between guest stays. However, it is also crucial to replace all linens and towels with new ones on a regular basis. After all, who wants to sleep on threadbare sheets or dry off with a worn towel? Unfortunately, this is a task that often goes forgotten for much too long, leaving valuable guests with less-than-ideal sheets, blankets, and bath towels. This can lead to bad reviews and unhappy customers. In order to ensure you keep visitors happy and well taken care of, use your annual spring cleaning time as a reminder to buy new sheets and towels for your rental space. This doesn’t need to be a huge expense and will add that new, clean feel all renters look for. #5: Make an ironclad turnover plan. More guests means faster turnover times, which means more work for you. This is a great thing, but failure to have a solid plan in place for quick turnaround days can leave you in a lurch. Additionally, you will want to have a backup plan for those times when you’re not working with ideal circumstances. Some good options include hiring a cleaning service, bringing on a couple of part-time staff members, or always leaving yourself 2 or more days to get things ready for the next guest. Remember when we mentioned that guests tend to see flaws you might miss? This is true of cleanliness as well. It’s easy to get the “obvious” spots, but what about the things that need to be attended to just occasionally? 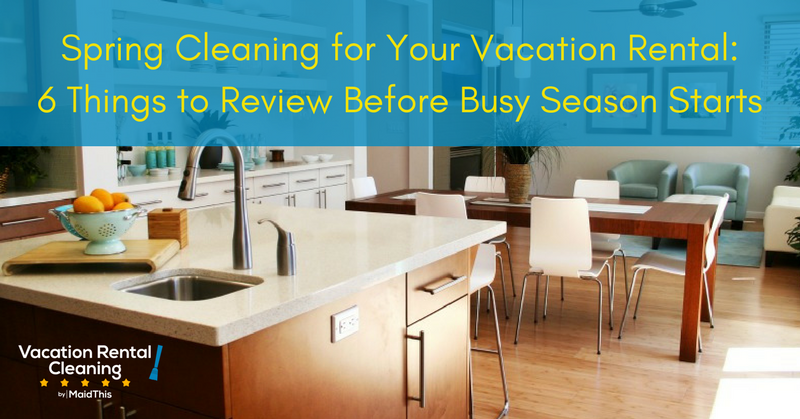 As no vacationer wants to stay in a dirty rental, cleaning should be at the top of your list of priorities. Therefore, if you have difficulty seeing dirty areas, you will want to bring someone in to pinpoint the parts of the house in need of cleaning. If you are short on time, consider bringing in a professional cleaning company. They will be able to easily identify the parts of your home that need the most attention and clean them efficiently and effectively. While developing your cleaning plan, keep in mind that the time before busy season is the best time to do your deepest cleaning. Things like shampooing carpets, power-washing sidewalks, and cleaning window exteriors can be done during this period without disturbing renters. Doing these tasks now will ensure your place is spick-and-span for summer and will make cleaning between guests a much easier undertaking. Spring cleaning and preparation are crucial for success during the busy season. By using the tips above, you can ensure you are well prepared to take on all the extra work the season brings while still keeping your guests as comfortable as possible. Would you like help cleaning your property to prepare for summer? Do you need assistance during those fast turnover days? We’re here to help! Learn more about MaidThis! vacation rental cleaning today.